For more than a decade, micro-needling has been considered the secret weapon among anti-aging methods used to treat visible skin problems. Activate the benefits of your skin’s natural protective mechanisms with the micro-needling method, which is based on the principle of applying tiny punctures to your skin that stimulate your tissue to immediately regenerate itself. REVIDERM’s state-of-the-art micro-needling technology SkinNeedler perforates the surface of your skin with ultra-fine needles without damaging it. The targeted treatment stimulates cell growth and strengthens the resistability of your skin with long-lasting results. At the same, the micro-needling method boosts the collagenous fibers in your skin’s tissue. ** According to scientific literature data on micro-needling.Optimal results after approx. 8 months. 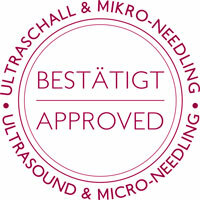 More precise: Ultra-fine needles arranged closely together in a row ensure exact treatment results. More effective: The 4.5 watt motor is one of the most powerful on the market and ensures that the fine needles penetrate your skin exactly where required before being quickly removed. Gentler: Thanks to the significantly higher frequency, your skin is not scratched or torn, enabling it to be cared for efficiently without any side effects. Aging skin with declining firmness.